These cookies could be made with nuts instead of chocolate chips if you prefer! 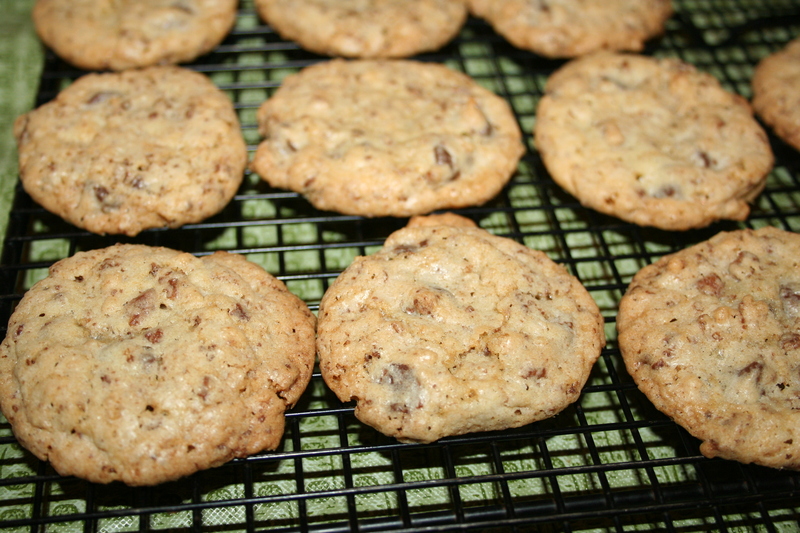 Today’s recipe is another one of my favorite cookie recipes, one we’ve made for years and years. Way back when I was a Girl Scout, I used to participate in the Girl Scout Bake Off each year and one of the years I earned second place with these cookies! That’s how long my family has been making them. We call them Chocolate Chip Butterballs, but they have many other names: Snowballs, Mexican Wedding Balls, Hazelnut Balls and probably other names I don’t even know about. Traditionally they are made with nuts. I don’t like nuts, my family never baked with nuts growing up and I don’t either We all really love Chocolate Chips though, so my mom has always subbed in the chocolate chips for nuts. You can choose either mini chips or the regular sized chips. Personally, I prefer the big ones, but if you don’t, switch them for the minis instead. If you’re into tasting batter, this one is safe to eat, there are no eggs in this recipe. I’m always pretty sure I’d come out with about six more cookies in each batch if I ate less batter! This recipe can be made fast and easy if you have extra set(s) of hands to help you roll the batter into balls! This is one I often let my kids help with. I don’t usually have them roll the hot ones in the sugar though, even though I use a spoon for that. Their “part” is the cold batter getting rolled into the balls for baking. Be sure to check back tomorrow to see what the coordinating kids’ activities are for this recipe! Combine flour, butter, granulated sugar, salt, vanilla in bowl of electric mixer. Mix well. 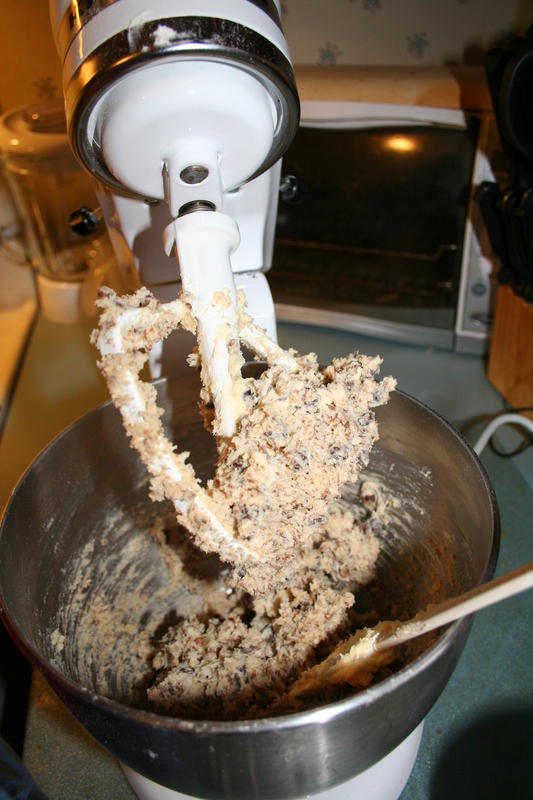 Add in chocolate chips, mix them into the batter. Form into 1″ balls, place on cookie sheet. These don’t spread, so you can put a lot on a sheet, no need to spread them out a ton. Cool only slightly, maybe a minute or so, and then roll each one in a bowl of confectioner’s sugar. Roll a second time in confectioner’s sugar before serving. Categories chocolate chips, Christmas, Christmas Cookies, Cooking with Kids, dessert, Jennifer L. Cowart, Kids, Motherhood, Recipes, Your Tray or Mine? I first posted this recipe on my FB page on December 5, 2008!! It’s a cookie recipe my mom and I make every year, and if I had to pick a top favorite, this would be in my top two. I LOVE these cookies. They’re easy to make and easy to just POP into your mouth!! And, they’re chocolate on chocolate. I mean really…how much better can you get than that? This is a rolled cookie, so your kids can help you if you’d like them to. They can also use their thumbs to make the indentation in the cookies for the filling. Almost ready to go in the oven! Alex did almost all the measuring and mixing for the thumbprints herself, with very little help from me. In large bowl, cream margarine and sugar until light and fluffy. Blend in vanilla, chocolate and egg. Lightly spoon flour into measuring cup, level off. Gradually add flour to creamed mixture, mix well. Chill dough 30 minutes for easier handling. Shape dough into 1″ balls, place 2″ apart on ungreased cookie sheets or parchment lined sheets. With thumb, make imprint in center of each cookie. Bake at 375 degrees 8-10 minutes. Let cool one minute before removing from cookie sheets. Fill with chocolate cream filling. Thumbprints are ready to be filled! In small saucepan melt chocoalte chips with corn syup, water and margarine over low heat, stirring constantly. Stir in vanilla. Spoon 1 tsp into each cookie. These are fast and easy cookies to make and one of my kids’ favorites. Today’s recipe is a new addition to our cookie trays. It is not one that we did when I was growing up but it’s one I include every year now. Several years ago when my kids were in preschool we attended a book fair there prior to Christmas. I got them a “Strawberry Shortcake Holiday Treats” cookbook and this recipe is from there! It had all “regular” ingredients (aka ingredients I had on hand) and that’s why I liked it. I usually have them help me by dropping the cookie dough in the cinnamon and sugar and having them roll them. Rolled cookies are good for that! I often double this one, it’s a fast tray filler. Tomorrow be on the lookout for a fun craft for the kids to go along with this recipe! Here’s the girls’ cookbook that this recipe came from. Use the electric mixer to cream together the butter and 1 cup of sugar. Beat in the egg. Add the milk and vanilla. Beat until all combined. Add in dry ingredients and beat til well mixed. In the small bowl, stir together the 2 TBL sugar and 1/2 tsp cinnamon. Roll the dough into 1″ balls. Roll the balls in the cinnamon sugar mixture and place them about two inches apart on the baking tray. Bake for 10-12 minutes or until cookies are done. Remove to wire rack and cool completely. Categories Christmas, Christmas Cookies, Cooking with Kids, dessert, Jennifer L. Cowart, Kids, Recipes, Your Tray or Mine? These are my other top favorite cookie from our trays! This week I was invited to participate in such a fun activity: a digital cookie exchange! Now, you know how much I love cookies, and what a fun idea to do an online recipe swap! I was invited by Patience Brewster, a company that offers a unique line of handmade, hand painted ornaments and gifts for holiday and every day decor. Their products are so beautiful! Every piece in the collection is based on original artwork by artist/designer Patience Brewster and is filled with intricate details and fanciful designs. You can read more about the company here. As I was going through my favorite cookie recipes, trying to decide which one to choose for today’s online cookie exchange with Patience Brewster, I had such a hard time deciding! Not just any cookie would do. Ultimately I decided to run the recipe for one of my top two favorite Christmas cookies, the Chocolate Buttersweets. These cookies were the ultimate equivalent of a beautiful Patience Brewster ornament, in a cookie. Hand-glazed, multi-step, multi-layer, delectable cookies, beautiful confections….it’s a perfect fit. Below you’ll find the step-by-step instructions for this cookie. I hope you’ll give it a try, and I certainly hope that you’ll go on over to the Patience Brewster site and and take a look at their beautiful creations. In the meantime, I’d like to tag my friend Paula over at My Soup for You and invite her to join in on our online cookie exchange! Paula is a wonderful cook and baker, and I know she’ll be doing some baking this weekend, too! In fact, I’d like to challenge all of my readers and fellow bloggers. Link up a great cookie recipe in the comments here, blog about a good cookie recipe on your own blog, or share a cookie recipe wherever you share, and tag us all! When I first began the Your Tray or Mine series of recipes earlier this month, I began with the Chocolate Thumbprints, which I said were one of my top two favorite cookie recipes from the trays my mom and I do. Today’s cookie, the Chocolate Buttersweets, are my other top favorite cookie on the tray. This recipe is not complicated, although it does have three distinct steps: the cookie, the filling and the frosting. Because the cookie should be frosted when it’s warm (but not hot) I recommend prepping the filling first, so that it’s ready. Then make your cookies, and after they are filled, make your frosting and frost the filled cookies. If you have a wooden spoon with a round handle, you can use it to poke the holes in the tops of the cookies before baking. **Prepare the filling first. The cookies, when done, need to be filled while warm. Have the filling ready to go. 1) In large bowl cream together butter, confectioners sugar, salt and vanilla. 2) Gradually add flour to creamed mixture, mix well. 3) Roll dough into 1″ balls, placing them 2″ apart on ungreased cookie sheets. 5) Bake at 350 for 12-15 minutes until edges are lightly brown. Step two: fill the cookies while warm. Soften cream cheese. Blend in sugar, flour, vanilla. Cream well. Fill cookies. In small saucepan melt chocolate chips, butter, and water over low heat. Stir constantly. Stir in confectioners sugar and mix well. Will be lumpy at first until the sugar melts. Spoon a little frosting onto each cookie. Categories chocolate chips, Christmas, Christmas Cookies, dessert, Jennifer L. Cowart, Recipes, Your Tray or Mine? In keeping with my promise to do one bar recipe each Sunday, here is today’s recipe. Here’s the original recipe that I work from when I make these! It’s funny to see my old handwriting and maiden name! This is such an old recipe that I’ve been making since I was in elementary school. When I was in about 4th grade the Girl Scouts had a bake off and I won twice with this recipe. When I make them, I still read off a photocopy of the original recipe card that I wrote out for the contest. It’s funny to see my 4th gr. handwriting and my maiden name at the top. You can use raspberry, strawberry, or apricot jelly. These are fast and easy and only have a few ingredients. I make them several times each holiday season. A friend of mine even melts chocolate and drizzles it over the top before cutting. This recipe says to grease an 8 x 12 pan, but I use 11×7. You probably could use 9 x 13, they’d just be thinner. Mix together all ingredients EXCEPT jelly. Beat at low speed, scraping sides of bowl occasionally until evenly mixed. Reserve approx. 1 cup of mixture, set aside. This recipe has lots of opportunities for the kids to help out including measuring the ingredients and putting the dough and jam into the dish. Press remaining mixture into baking dish. Spread jelly within 1/2″ of edges. Crumble (break into little pieces and drop them all over the top) the remaining 1 cup of batter over the jelly. Bake at 350 degrees 42-50 minutes until lightly brown around the edges. Cool completely and cut into bars. This is how the raspberry squares look just before going into the oven…. ….and how they look when they come out, nice and brown around the edges! Here’s the apricot version of these bars, just as delicious! Categories Christmas, Christmas Cookies, dessert, Jennifer L. Cowart, Recipes, Your Tray or Mine? Hot out of the oven, this peanut butter-chocolate chip dessert is one of our favorites! This recipe incorporates peanut butter, so if you have allergies…please take note. I love this one, it’s super fast and easy and as the title says: delicious. Kids can totally help out with this one too, it’s literally just layering of ingredients, dumping bags of chips into a baking pan. Preheat oven to 350 degrees or 325 for a glass dish. In 13×9 pan, melt one stick of butter in the heated oven. Spread 1 1/2 cups of the crushed wafers into the melted butter. Pour 1 can (14 oz) of Sweetened Condensed Milk evenly over crumbs. Press down slightly to set. Bake 25-30 minutes or until lightly browned. You don’t even need a mixing bowl for this recipe. You just layer it all in the baking dish. Categories chocolate chips, Christmas, Christmas Cookies, Cooking with Kids, dessert, Jennifer L. Cowart, Recipes, Your Tray or Mine? The most recent time I made these, I used a mix of both chocolate Rice Krispies and the plain Rice Krispies. they were delicious! The following recipe is a newer recipe to my collection, not one that I grew up on as we did our cookie trays when I was growing up. But, I like this recipe because it’s fast and easy, and it’s not “just” another chocolate chip cookie recipe, the cereal gives it an added crunch. I often double this recipe, it makes a lot and it’s a good filler on the trays. I have yet to have someone say they didn’t like these cookies! I got the recipe from a cookbook I’ve had since before I was married. I always find the best recipes in it! It’s called “Favorite Brand Name Cookie Collection.” I did add the word “Krispie” to the title myself though. There’s lots of measuring, pouring and mixing in this recipe. 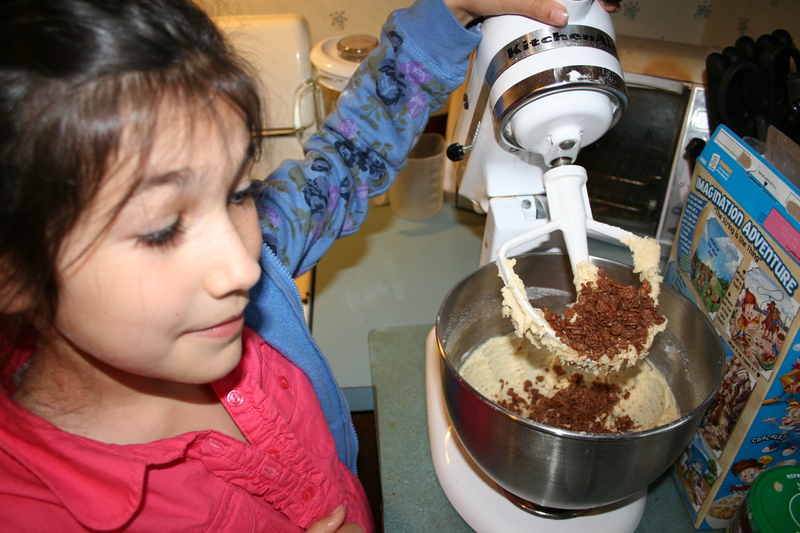 Great opportunities for kids to help out in the kitchen, and for them to learn by doing. Stir together flour, baking soda, salt in a medium bowl. Set aside. In a large mixing bowl beat margarine and sugar until well combined. Add egg and vanilla. Beat well. Add flour mixture. Mix thoroughly. 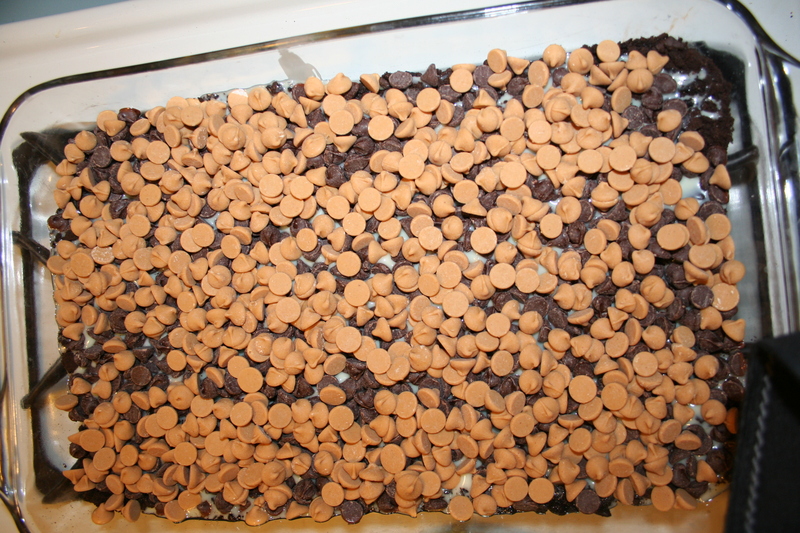 Stir in Rice Krispies cereal and chocolate chips. Bake at 350 degrees for about 12 minutes or until lightly browned. Remove immediately from cookie sheets and cool on wire wracks. Categories chocolate chips, Christmas, Christmas Cookies, Cooking with Kids, dessert, Jennifer L. Cowart, Kids, Motherhood, Parenthood, Recipes, Your Tray or Mine?